Water Coolers are a great way to have fresh chilled, or hot water, at your fingertips. These water cooler units are ideal for use in areas such as factories, warehouses, community centres, gyms and large retail areas. You have the option of bottle replacement or you can have it plumbed directly into your existing water supply. The RM Series water cooler cabinets are made of rota-moulded, pigmented polyethylene. This U.V. stabilised material provides an external cabinet which is durable, modern and 100% rust proof and also come in a variety of colours. 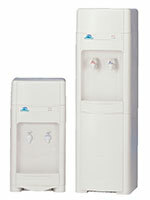 These water coolers provide a never ending supply of refreshing Hot & Cold or Cool & Cold water. 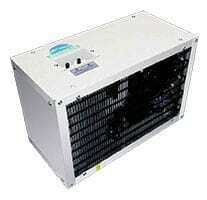 They attach directly to your water source and are able to accommodate a variety of purification devices. The large 12 litre reservoir makes it the ideal choice for use with Reverse Osmosis purification systems and the fast flow levers and high clearance recessed alcove make it easy to draw water. Refined yet durable, these water coolers have a captivating modern style which harmonises with a variety of decors and are engineered to the highest levels of quality. The Waterworks IC8 compact, remote chiller is designed for use with drinking fountains, filters, bubblers or glass fillers, thereby enabling any drinking station to supply chilled refreshing water. It can be installed under a sink or bench, in the ceiling, on a column, an adjacent wall, or in a service area. In fact it’s perfect for virtually any single remote outlet at home or in the office and with the addition of optional filtration, it delivers fresh, clean, chilled water at the touch of a button.